You can't cure the pox with further whoring. Tobias Menzies as Hurst, Edward Peel as Musgrave, Dermot Kerrigan as Walsh, Sam Cox as The Parson and Colin Tarrant as The Mayor. John Arden's popular 1959 play, Serjeant Musgrave's Dance about soldiers and colonialism, said to be his most important work, is frequently revived but it is the first time I have had the opportunity to see it and Curtain Up to review it. Sean Holmes directs this excellent production from the Oxford Stage Company which is on at Greenwich Theatre and then on tour nationally. The play is set in the nineteenth century under the reign of Queen Victoria at the height of the British Empire, before the advent of modern warfare but none the less has much to say about the military man and his relationship to the state which has modern resonance. Three soldiers under the leadership of Serjeant Musgrave (Edward Peel) arrive in a northern mining town where the miners are in the middle of an industrial dispute. The mine owners say that the miners are striking, the miners say that the owners have locked them out. 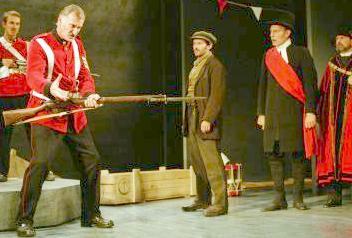 The forces of order, the parson (Sam Cox), the mayor (Colin Tarrant) and the police constable (Simon Walter) welcome the soldiers because they see them as the answer to keeping public order. In fact Serjeant Musgrave's agenda is more complicated. These soldiers are deserters from an obscure colonial posting. They have returned home to tell the British public that massacring civilians is not the answer as it leads to more soldiers being killed, more military reinforcements being brought in and so the cycle repeats and permeates. The three act construction is very satisfying and lucid. The first act sets up the characters, the overall situation in the town and in the tavern. The second act brings a problem when one of the soldiers, Private Sparky (Billy Carter), is killed by another soldier because he might be thinking of leaving the group. They justify this act as killing a deserter. He is of course already a deserter, as are all four of them. The third act sees a near riot and a flag waving recruiting meeting being set up to divert the striking miners from unrest. The skeleton of a local man who died in uniform abroad is raised to make Musgrave's point. Brought on to demonstrate its capabilities, the Gatling automatic six barrelled gun is pointed at the crowd. Will the Serjeant use it when the mob refuse to accept his interpretation of the military role in the colonies? How will Musgrave attempt to explain the death of Sparky? There is sterling work from the ensemble and tight direction so that almost three hours speeds by. The soldiers establish their differing characters proving that they are not uniform. Sam Cox is an exemplary, stuffy, upper class, gas and gaiters parson. Maxine Peake is outstanding as Annie, the girl left pregnant by another soldier who was killed and who gave birth to a damaged child that died. Lost her man, lost her child, almost lost her sanity. Fred Pearson adds plenty of yokel atmosphere as the anarchic Bludgeon. There is use of snatches of folk song and verse giving a nineteenth century flavour. Musgrave's magnificent dance mesmerises as he stamps and cavorts, turning the recruitment meeting to his own agenda. Sets are minimal but authentic: a Victorian pillar box, a bar with etched glass, the town square with bunting. There is no doubt that Arden intended this as an anti-war play but its interest is that these are real soldiers who are advocating an alternative to the expansion of killing, what Musgrave calls "Wild Wood Mad" disease. There is some mysticism in the play which strikes a 1950s note; for example, Musgrave's nightmare. Musgrave is a strange mixture of Puritan, high moral standards and anti-anarchy, power crazed controller and charismatic leader but he did believe that he could make a difference. Oxford Stage Company are to be congratulated in taking these quality productions, better than much in the West End, to the regions. Greenwich Theatre is just a few minutes from central London by train or Docklands Light Railway. Ticket prices in the theatre are a fraction of the West End and the repertory programme has much to commend it. Running time: Two hours fifty minutes with two 15 minute intervals. Touring next to Exeter, Edinburgh, Oxford, Bury St Edmunds and York.